So many memories are flooding in as I write this post. Our home was the official headquarters of dosa, or should I call it the dosa factory. All my friends will vouch for that and to many of them my mom was a friend and a confidante more than a mere ‘aunty’. In India we do not call elders by their name, so every friend’s mom is an aunty. Now that I think of it, I would always bring in friends from school and it was understood that they would be having lunch at my place. When I turned 16, my mom threw me a surprise party, she invited all my friends and had a huge poster of sweet sixteen up in the living room - which she painted herself. We must have been some 20 kids - dosas for 20 giggly teens is not an easy task. Can you imagine, I do not have a single photograph from it, but everything is crystal clear in my mind…I remember it like yesterday. A baby pink poster with a pink rose (hand painted) and sweet sixteen painted on it. My teen turns sixteen next year, am not sure if anything can top what mom did for me…life is such a full circle. I can’t imagine that so much time has gone by. As I make dosas for my teen and her friends, I always think of my mom and her kitchen, her 1000 watt smile, that can light up a room even today - she has never frowned, it’s always smiles, in good times and otherwise. She did have her share of anger - but frown, hardly. Life has always smiled back at her. Her smile is still as young as probably when she was sixteen. 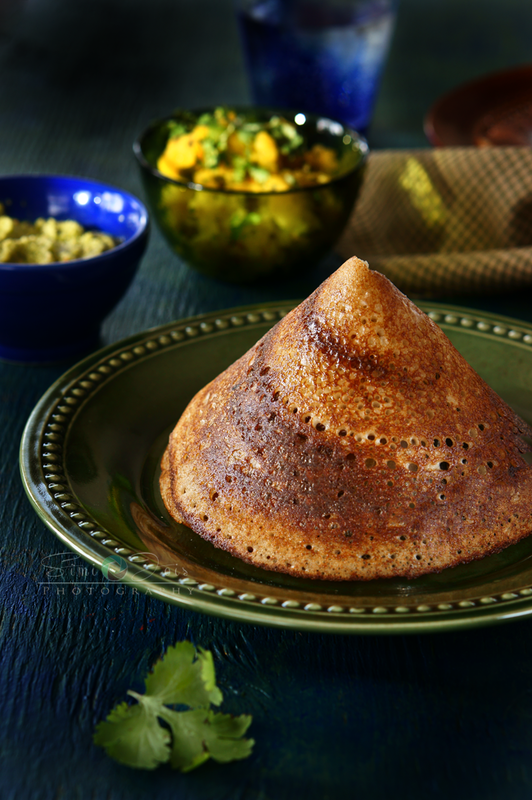 To me dosa is not a mere south Indian delicacy, it’s memories, it’s soul food ….it’s the key to Indian hospitality. Probably that is why my family thinks it’s one of the things I make best. (if I may say so myself). Probably some where I feel the need to keep up with my mother’s standards of not only making perfect dosas but of hospitality, of serving food with a smile, that shines from within. If you need to make Dosa you need to plan a bit as you need to soak the lentils and rice and then grind them into a fine paste and let it ferment. So if you want dosa for dinner tonight you should have soaked the grains last night. Wash and soak the above ingredients in water for about 6-8 hrs (overnight). Grind into fine paste. When you feel the dough between your index finger and thumb it should feel smooth. Let it ferment for about 3-4 hrs in summer and about 5-6 in winter. 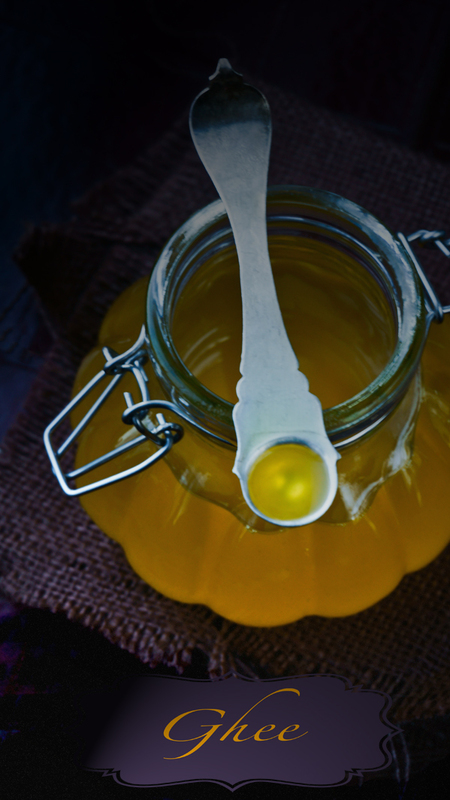 It becomes light and airy after fermentation. Add a little water if necessary. The batter should not be too thick, neither too watery ( lighter than pancake batter) U can always add some water to the batter if you think it is too thick and does not spread well. Batter stays good for 7-10 days. 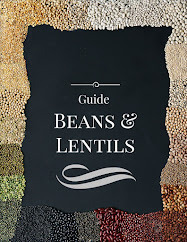 Take half a tsp oil and roast the urad and chana, till golden brown. Add everything in a blender, along with the daals and grind coarsely, adding little water. Do not make the chutney watery. For tempering, heat the oil add mustard seeds let it splatter, add asafetida and curry leaves and when it is hot, add it to the chutney. juice of half lime or 1 small lime. Peal the boiled potatoes and mash them ( not very mushy). In a sauce pan heat oil, add the mustard, let it spurt, add urad and chana after it is golden brown add the curry leaves, green chili and ginger, followed by onion, after the onion is a bit brown, add mashed potatoes, salt, turmeric and lime juice. Toss the potatoes so everything is well mixed and garnish with cilantro. Now keep the chutney and the potatoes next to you by the dosa pan. 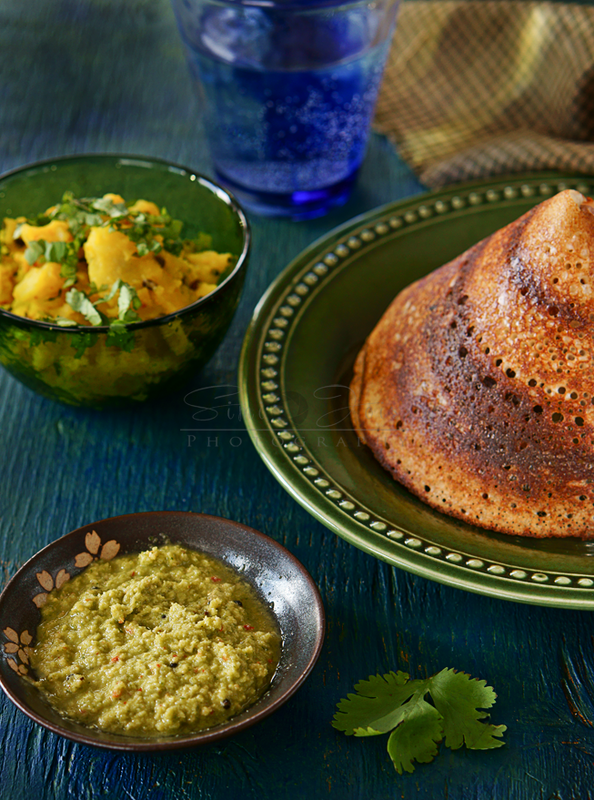 Heat the griddle….dosas taste best made on a cast iron griddle . Pour a spoonful of batter in the center, spread round with the help of the back of the spoon. Pour ½ tsp of oil all around the edges and cover for 15-20 sec. I like my dosa crisp on one side and spongy on the other, so I do not like to turn it and roast, it’s really your choice. Lower the heat, add chutney on one side followed by a spoon of potato subji, add a generous swirl of butter, close the dosa and add a tbsp of fresh home made ghee. The dosa could be served with potato and chutney inside or it could be served with the potatoes and chutney as a side. It may or may not be served with sambhar - here is the recipe for sambhar. Wow..amazing pictures. .love dosa anytime! ! like hyderabadi biriyani...mysore masala dosa is famous....i donno anyone who dont like it....nice clicks. Have never had a dosa...let alone to make one. It looks very tempting! What a wonderful memory you have of your birthday-----and now with a child turning that age too. I will never make this recipe, but I would love to sit at your table and eat them-------eat a lot of them. Carol, it looks complicated, but it really is not…easy to make once you get the hang of it. Its my all time favorite..looks great. WOW. 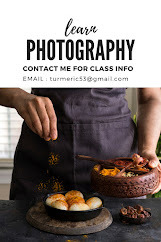 i have never heard of this dish before.. im an indian cuisine lover so i definitely need to try this out. thanks for sharing! 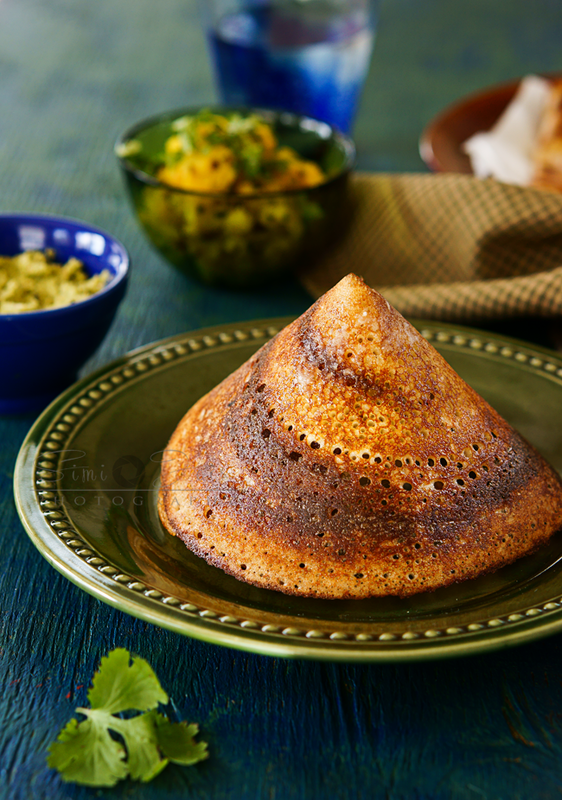 The dosa looks scrumptious and crisped to perfection. 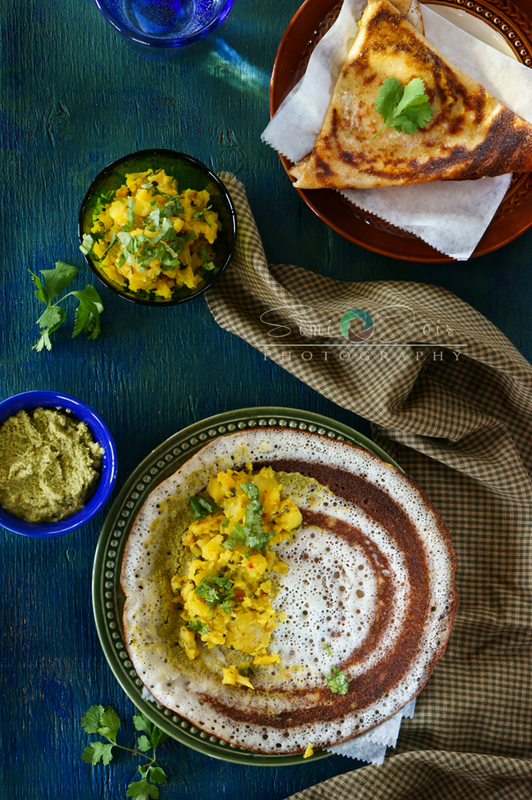 This dosa is a family favorite. We always prefer this over the regular dosa. This takes me back to my Sunday breakfasts in Bangalore. Culinary ecstasy indeed! And you have captured it beautifully. Dosas are our family favorite too and a life saver for me on busy week days. Your description of dosa was tempting. Delicious and lovely looking Mysore Masala Dosa. I've never been successful at making dosa from scratch - its sad because its one of my favorite foods! and I have fond memories of mysore masala dosa served at my college canteen (run by Shettys!) It was the best dosa I've had in my life. I make do with store bought dough these days - it works. If I muster up the courage, I might try this. 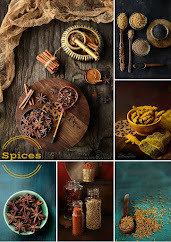 You photographs are awesome - especially the ghee one.